Tim Walters is a contributing strategic analyst for the Content Marketing Institute and co-founder and theorist at Digital Clarity Group, which was designated new analyst firm of the year 2014 by the IIAR. 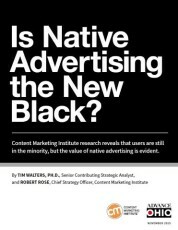 A recognized thought leader on digital disruption and marketing strategy, Tim’s recent publications include "The CEM Imperative” and “Beyond Marketing.” For CMI, he has authored reports on content marketing and native advertising. Follow him on Twitter @tim_walters. Picture a single-page guide to nine types of oysters, each described in a few clever, informative sentences. It seems like a great editorial piece for Esquire magazine, where it appeared in the early 1950s, except a pint Guinness beer smiles in the lower right corner. The whole thing is an iconic “advertorial” created by advertising mastermind David Ogilvy.